A beautifully sunny Easter holiday! What do the chickens do during the holidays when Orion children are not at school? They have a nice nap! The chickens particularly like napping under the shed! The weather was warm and sunny and the chickens don't always like being in the sun for long periods of time! Snuggling down in a hole under the shed is one of their favourite things to do! 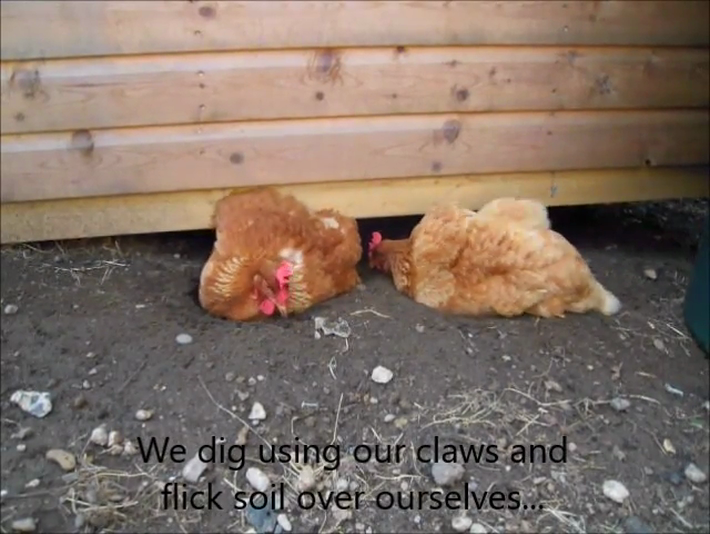 They dig the holes using their sharp claws and sometimes there is some fussing between the chickens about who is going to use the hole! When the chickens roll around the ground, it can look quite strange! But they are just giving themselves a bath! The soil is good for getting rid of bugs on their bodies and keeping them healthy! They throw soil all over themselves, roll around and make happy noises! See if you can catch them having a bath! When it's very hot and sunny, the chickens like to stay in the shade and hide under the shed. Chickens don't sweat so an over-heated chicken may open their beaks to pant or hold their wings away from their bodies to stay cool. Pet Club children cared for the chickens during this hot weather by making sure there was lots of water available. A new roof was also put up to create more shade. Happy chickens chilling out in the shade! In May, Chris Collins, the Blue Peter gardener visited the school to hold some gardening workshops. Some lucky children did some planting with him. Chris and the children even planted some apple trees in the allotment and in the animals' yard! This is great as the trees will produce apples (which the animals love) and will also be a great place to shade under! Thanks Chris! At the end of term in July, the weather got really hot again! We might enjoy 30 degree heat but not the poor chickens! They spent lots of time in the shade and stood around with their wings held open. Then in typical British summer fashion, the rain began! The chickens did not like that either! They hid under their hen house to try to keep dry. Cheeky chickens also tried to escape the rain by hiding in the shed! Birds' feathers do an important job. Not only can they help keep the bird warm, they can also keep the bird dry. Penguin feathers are almost waterproof and although chickens feathers are not waterproof, they are water resistant! Birds have an oil gland near the base of their tail which contain oils that they spread on their feathers. When you see a bird take a feather and run it through its beak, they are preening. This just means they are keeping their feathers neat and tidy and in a way, moisturising them! By spreading the oil over their feathers, it makes them water-resistant. If you watch our Orion chickens long enough, you will see them preening! If a chickens stays in the rain long enough, she will get soaked through!